Whether you're looking to feed plants in your garden or grow them inside containers that are kept indoors, a fertilizer of some kind will be needed. It's important to understand, however, that not all fertilizers are the same. Fertilizer can be categorized as one of two types: organic fertilizer and inorganic fertilizer. 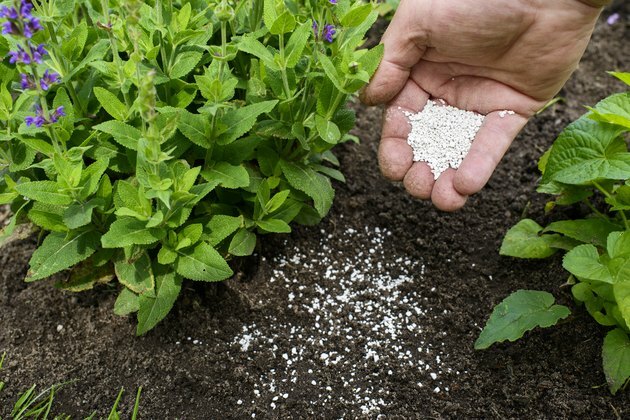 There are pros and cons to each type of fertilizer, and one may fit your needs better than the other, but understanding examples of inorganic fertilizer can help you make the right choice for your plants. In order to identify the different types of fertilizer, it's important to have a general idea of the differences between organic and inorganic varieties. Organic fertilizer refers to anything that comes from natural plant or animal sources, like composted food scraps or bone meal. Organic fertilizer does contain nutrients derived from plants but in lower amounts than inorganic fertilizer, which results in a slower release over a longer period of time. Some people prefer organic varieties for its ability to improve the quality of the soil by allowing water to move easily through it. Inorganic fertilizers or inorganic manure mostly comes from mineral deposits that are then manufactured to form synthetic compounds. Types of inorganic manure include potassium nitrate and ammonium nitrate. When you're shopping for inorganic fertilizer, which can be found at most hardware or lawn and garden centers, the percentage of each nutrient will be listed in the order of nitrogen, phosphorous and potassium. If a bag of inorganic fertilizer reads 10-30-10, that means it's made up of 10 percent nitrogen, 30 percent phosphorus and 10 percent potassium. Like most things in life, inorganic fertilizer comes with positive and negative qualities. Choosing whether you need inorganic or organic fertilizer will likely depend on the quality of your soil and what you are trying to grow in it. One plus of using an inorganic fertilizer is that you can give your plants only the nutrient they are lacking without overdosing them on others that they may not need. For example, if your soil is potassium deficient, you can find an inorganic fertilizer to feed your plants that measures higher in potassium. Inorganic fertilizer can also come with its fair share of worries. Because inorganic fertilizer is not natural, it does contain additional materials that can build up over time and harm soil, like excessive amounts of salt. Overwatering plants fed with inorganic fertilizer can also lead to leeching, which causes essential nutrients like nitrogen to be washed away before plants have a chance to absorb it. If you're looking to farm certain plants, namely food crops, you'll have to decide whether you want to do so using organic or inorganic farming methods. This will determine which type of fertilizer your plants will be fed. Organic farming refers to plants raised without the help of genetically modified seeds, synthetic pesticides or inorganic fertilizers. Keeping an organic practice is said to improve the quality of soil over time and enhance local ecosystems through higher water quality and maintaining a biodiverse environment. Inorganic farming methods refer to those which use nonorganic sprays or fertilizer to protect and feed crops. Most large farms use inorganic farming practices for various types of inorganic farming for its relatively inexpensive and efficient crop production methods. Inorganic farming relies on chemical fertilizer, which is added to improve the quality of soil by adding additional nutrients when needed. Harvested plants will usually lose nutrients after being pulled from the soil, so it's important that they are fed a healthy diet before that time in order to produce quality crops. Why Does Salt Affect the Germination of Seeds? Can Plant Food Go Bad?